This is obviously incorrect, and the test is looking at uplinks rather than physical NICs. The bottom line is that we are aware of the issue, and if you have a LAG configured for the vSAN network, you can safely ignore this warning in Configuration Assistant. We are working on a solution. Before finishing, I’d like to take an opportunity to point you to our new vSAN Network Design Guide, which has lots of good information around LACP, LAG and many other network considerations for vSAN. Please check it out. You can download it as a PDF for your reference. Feedback always welcomed. Cormac, although not related to this, I deployed my first vSAN 6.6 2-node cluster out of 75 that I need to deploy. The Configuration Assistant as well as the Health Check reports Network Configuration warnings for MTU large packet test between the nodes and the witness. Sometimes is node 1 to witness, other times is node 2 to witness, other times witness to node 1, etc. Every component, physical and virtual in both sides is set for 9000 MTU. I changed everything to 1500 to test and the results are the same for the large packet test. Could it be also an issue with 6.6 reporting warnings erroneously as same as the issue you described in this article? Is VMware aware of other similar cases? No, it is not the vMotion check. The vMotion check is good since I am using the default stack. It is the vSAN Network MTU large packet the one that shows the warnings. I’m not sure Mario – can you raise this with GSS? Did that already. The ticket has been opened for five days. No solution so far. Suggestion: Your blogs are an exceptional source of help. 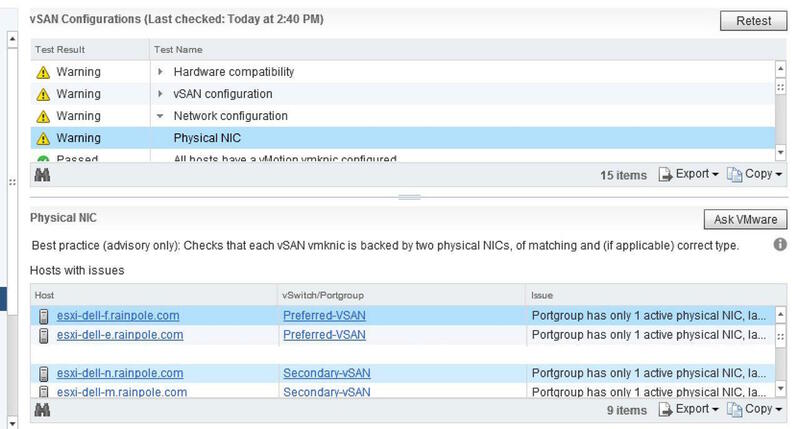 Maybe you would like to update the vSAN witness implementation/configuration for 6.6 with an emphasis on 2-node direct connected. Although this document: https://storagehub.vmware.com/#!/vmware-vsan/vsan-stretched-cluster-2-node-guide/using-a-vsan-witness-appliance-1/1 gives good details, I do not think, in my particular opinion, it’s clear enough for a vSAN 2-node with direct connection.